In Southern India, in the state of Karnataka, a majority of the of the Forest Department camp mahouts have been working with elephants for generations, but are rarely exposed to current information about elephants and elephant management. Due mainly to human-elephant conflict, new elephants are arriving at the camps from various parts of the State. As a result, the Karnataka Forest Department is recruiting new mahouts and Kavadis (assistant mahouts) to care for the 122 elephants. Elephants and mahouts benefit greatly from training and being giving an opportunity to share information. Our partner and friend, S. Mamatha (pictured above on the left), saw an opportunity to improve the lives of the elephants and mahouts and organized mahout workshops on September 5th-7th at the Dubare, Balle, and Rampura elephant camps. 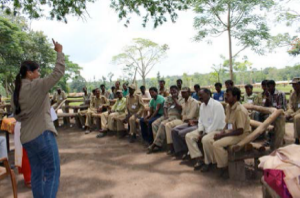 Utilizing presentations, discussions, and hands-on activities, the workshop addressed topics including challenges in the daily work with elephants, habitat conservation efforts, and captive elephant management. A questionnaire was part of the registration process and provided a lot of valuable information needed to establish a future network of communication both locally and regionally. AES advisor, Heidi Riddle, was also on hand to share her knowledge of elephant care and management in other Asian countries and western facilities. The Forest Department staff and mahouts enjoyed the workshop, provided a lot of positive feedback, and expressed an interest in future programs. We thank YOU, our supporters, for helping us sponsor Mamatha's work and appreciate your continued support!